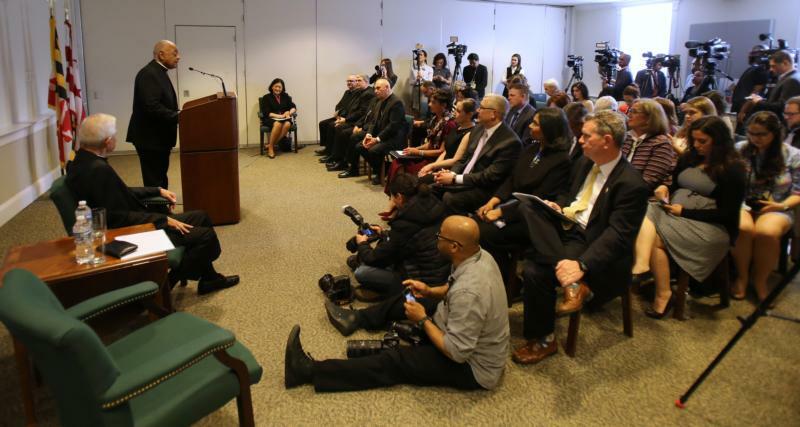 NEW YORK – In his opening words to an archdiocese reeling from scandal and accusations of sexual abuse cover-up, the newly appointed leader to Catholics in the nation’s capital, Archbishop Wilton Gregory, pledged to always tell the truth. The long-anticipated news of Archbishop Gregory’s appointment to Washington was made public by the Vatican Thursday and comes seven months after Cardinal Donald Wuerl’s resignation was accepted by Pope Francis last October. Cardinal Wuerl, who introduced Archbishop Gregory, praised his pastoral abilities and said the archdiocese can look forward to the future with “great confidence” and enthusiasm” under Archbishop Gregory’s leadership. “I would be naive not to acknowledge the unique task that awaits us,” he said, but pledged to offer hope and a rebuilding of trust. In vowing to turn a new page, he said he wanted to neither forget the past not be constrained by it. As the former president of the United States Conference of Catholic Bishops (USCCB) who guided the U.S. Church through its response to the clerical abuse crisis after the 2002 Boston Globe’s “Spotlight” revelations and helped pioneer new child protection protocols, he said “technical and structural responses” are crucial, but could not ignore the “spiritual dimensions” at the root of the crisis. The archbishop said, “so much of what we are facing now was a misuse of power, an abuse of power, clerical power,” which he said must confronted. When asked about area Catholics who are withholding financial gifts to the archdiocese and their local parishes, Archbishop Gregory said that the Church must do a better job of being transparent about how money is being spent related to abuse cases and where it is coming from. When asked when whether he would be willing to confront the failings of past leaders of the diocese, he promised transparency, which both includes admitting what he knows and what does not know. In speaking directly about Cardinal Wuerl, he said that the cardinal had admitted that he’s made mistakes in the past, which is a sign of integrity. He added that clericalism, however, is evident in the “circling of wagons” by bishops and cardinals to protect one another. As the leader of the nation’s capital, Archbishop Gregory said that his role was to be pastoral, not political. Looking ahead, Archbishop Gregory warned the archdiocesan staff that in the immediate future not to expect him in the office, but rather, immersing himself in local parish life, seeking an “encounter” with priests and the people alike. Also see: Pope Taps Gregory To Succeed Wuerl In Washington, D.C.